(Photo: Ecumenical News / Young Kun Park)Rev. 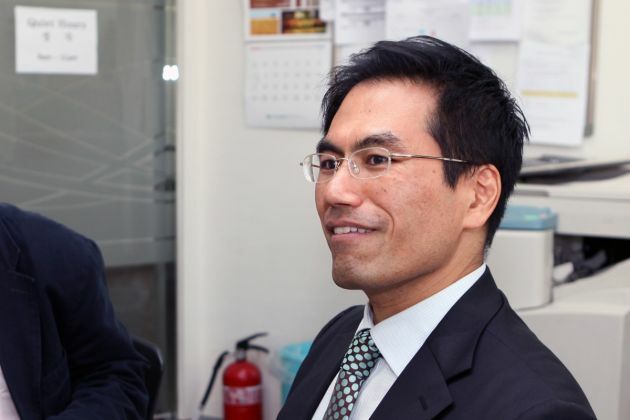 Stanley Kim, Senior Pastor at Antioch International Ministry, a ministry of the Sooyoungro Church in Busan, South Korea, speaks during an interview the church's office on November 3, 2013. BUSAN, South Korea – A South Korean pastor whose church does not agree with the World Council of Churches says this is due the political agenda of the global Christian grouping. Rev. Stanley Kim, of Antioch International Ministry in Busan, South Korea, told Ecumenical News the church with which he is affiliated, Sooyoungro Presbyterian Church in Busan, does not support the work of the World Council of Churches. Sooyoungro Presbyterian Church is the largest church in Busan with more than 30,000 members and it is not affiliated with the WCC which has global Christian unity as one of its key goals. "To talk about unity or the World Council of Churches, when it comes to unifying together, there are many different political agendas any kind of union can serve," said Kim who was ordained in the Presbyterian Church USA. "If any kind of political agenda becomes the church's agenda, rather than having the agenda of seeking God and receiving his gift, you'll find yourself running out of steam quick," he said. He explained that the Church should never be involved in making political statements. Danish Lutheran, Dean Anders Gadegaard, however, disagrees. Gadegaard responded to Kim's comments by saying, "It's good to have a political agenda. "I think churches imply necessary political work. But we do not achieve too much politically if we do not speak up. I appreciate the political agenda of the WCC. 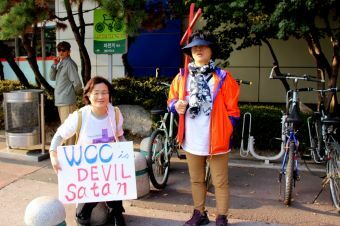 (Photo: Ecumenical News / Peter Kenny)Women in Busan, South Korea protest against World Council of Churches Assembly in their city on November 4, 2013. "My experience is you can go fairly far on issues if you take the time to speak together," said Gadegaard who served for many years on the main governing body of the WCC, its central committee. Gadegaard is a long time member of the ecumenical movement and is the moderator of WCC's Finance Committee. Kim sees the heart of Christianity in rediscovering the Gospel in fellowship, and believes this can be lost in the institutionalization of the faith tradition. "The first generation has the charisma and the second generation tried to institutionalize the charisma. The loss of genuine, fervent Christian community and everything that goes along with it is the real reason for the demise of Christianity," Kim said. "Getting our message to the world is not about making a statement but rediscovering and going back to what Church is."